Now, two researchers from the University of Kansas, Professor Hui Zhao and graduate student Samuel Lane, both of the Department of Physics & Astronomy, have connected a graphene layer with two other atomic layers (molybdenum diselenide and tungsten disulfide) thereby extending the lifetime of excited electrons in graphene by several hundred times. The finding will be published on Nano Futures, a newly launched and highly selective journal. The work at KU may speed development of ultrathin and flexible solar cells with high efficiency. For electronic and optoelectronic applications, graphene has excellent charge transport property. According to the researchers, electrons move in graphene at a speed of 1/30 of the speed of light—much faster than other materials. This might suggest that graphene can be used for solar cells, which convert energy from sunlight to electricity. But graphene has a major drawback that hinders such applications – its ultrashort lifetime of excited electrons (that is, the time an electron stays mobile) of only about one picosecond (one-millionth of one-millionth of a second, or 10-12 second). 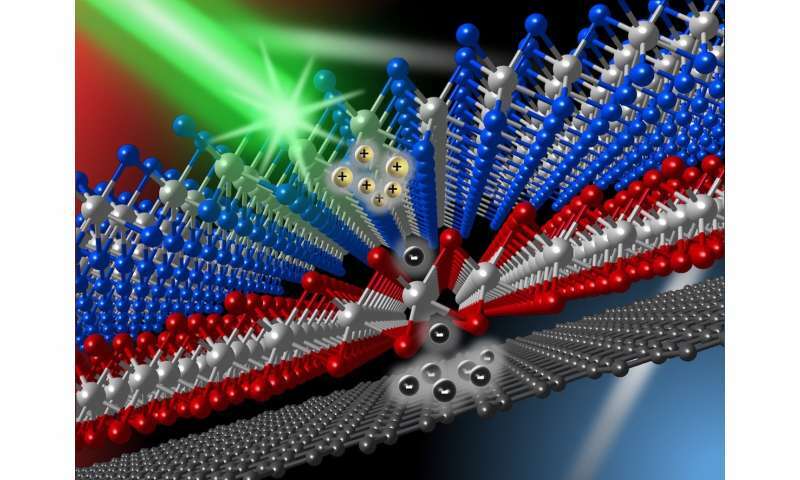 "These excited electrons are like students who stand up from their seats—after an energy drink, for example, which activates students like sunlight activates electrons," Zhao said. "The energized students move freely in the classroom—like human electric current." The KU researcher said one of the biggest challenges to achieving high efficiency in solar cells with graphene as the working material is that liberated electrons—or, the standing students—have a strong tendency to losing their energy and become immobile, like students sitting back down. "The number of electrons, or students from our example, who can contribute to the current is determined by the average time they can stay mobile after they are liberated by light," Zhao said. "In graphene, an electron stays free for only one picosecond. This is too short for accumulating a large number of mobile electrons. This is an intrinsic property of graphene and has been a big limiting factor for applying this material in photovoltaic or photo-sensing devices. In other words, although electrons in graphene can become mobile by light excitation and can move quickly, they only stay mobile too short a time to contribute to electricity." In their new paper, Zhao and Lane report this issue could be solved by using the so-called van der Waals materials. The principle of their approach is rather simple to understand. "We basically took the chairs away from the standing students so that they have nowhere to sit," Zhao said. "This forces the electrons to stay mobile for a time that is several hundred times longer than before." To achieve this goal, working in KU's Ultrafast Laser Lab, they designed a tri-layer material by putting single layers of MoSe2, WS2 and graphene on top of each other. "We can think of the MoSe2 and graphene layers as two classrooms full of students all sitting, while the middle WS2 layer acts as a hallway separating the two rooms," Zhao said. "When light strikes the sample, some of the electrons in MoSe2 are liberated. They are allowed to go across the WS2-layer hallway to enter the other room, which is graphene. However, the hallway is carefully designed so that the electrons have to leave their seats in MoSe2. Once in graphene, they have no choice but to stay mobile and hence contribute to electric currents, because their seats are no longer available to them." To demonstrate that the idea works, the KU researchers used an ultrashort laser pulse (0.1 picosecond) to liberate some of the electrons in MoSe2. By using another ultrashort laser pulse, they were able to monitor these electrons as they move to graphene. They found that these electrons move through the "hallway" in about 0.5 picosecond on average. They then stay mobile for about 400 picoseconds—a 400-fold improvement than a single layer of graphene, which they also measured in the same study. The researchers also confirm "seats" left in MoSe2 also stay unoccupied for the same amount of time. In the classical world, these seats should stay empty forever. In quantum mechanics, however, the electrons "tunnel" back to these seats. The researchers propose this process determined the lifetime of the mobile electrons. So, by choosing different "hallway" layers, this time can be controlled for various applications. If they are to having any hope of getting this out the lab and into the real world, they must now make this much more cost effective by finding a way to substitute all those precious expensive rare chemical elements in the layers, such molybdenum and tungsten etc, with reasonably cheap and relatively more common chemical elements, such at titanium and iron etc. They must redesign all the materials on the molecular level to be reasonably cheap and with fully scalable fabrication methods. I hope they have the wisdom to do that.